Well this is an interesting time. I am closer than ever to finishing a game that has taking me a long, long time to write. In the process I have learned much. Plenty about the iPhone, plenty about what I am trying to achieve, and plenty about how best I write games. It’s been written in many different places and countries, in different environments. In different personal circumstances, and different amounts of pressure, problems, and ease in life. I have become challenged, stressed, frustrated, philosophical, excited, happy and relaxed. – All along the way of writing this. I have met, through social media, through this, some great people. And continue to. Why am I a bit retrospective now? I am just about to take a short break, recharge my batteries, ready for the final run- the final push for promotion! I think I have it now, the feature set, there was something missing, I knew it, it frustrated me, it worked away in the background on me. Necessity is the mother of invention they say, but in this case you have to create your own necessity! So what was missing was filled. Now I have a stack of work implementing, but it’s enjoyable. It was always overshadowed by Football Manager, but I played it a year or two ago on emulator and it is a fun game still. I like some of the ideas I had in it. Here’s a bit of trivia, one person wrote to me that the game was immoral because you could be more successful by using Hype instead of Honesty. So it was encouraging people to be dishonest!! Is Hype dishonest? There is a question. Software Star title screen... monitors!! So now I play my new football manager type game. I enjoy it. I have the basis of what I want to be there. I get excited about what is happening. I make changes and try to do better. I know how it works but that doesn’t make it easier for me. Only 70% of the functionality is in place but I have the base to build from! Not easy to describe this. But it was important. Important to making it work, to making it succeed. I decided the setting, the football league, 4 divisions, plus a knockout cup, the FA Cup. I decided on what attributes your players would have. I decided what you could control. Then I pieced together the game balance. The balance between randomness and control, between complexity and ease of use. Various moving(mathematically) components interacting, finding the way to make it fun and easy but give the game plenty or range, so it did not repeat, was never predictable. And then it had to fit within the programming environment I had, and the small amount of memory. It took a year to make. 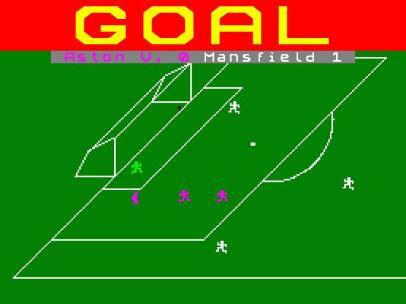 30 years ago Football Manager – making stick men footballers! I built intelligence into their behaviour. It was simple but effective. Within the limitations, there was an infinite variety of things that could happen, so it kept the excitement, the uncertainty during the match. 30 years on – the new Football Manager type game from me. So what was it that made the original Football Manager catch on so well, and what can I do now? Well since I wrote it, I know a lot about what made the original tick. I know I made it very playable, very enjoyable, and it had a pace that kept people playing it. I know this because it was all deliberate. I was not new to programming, it was my profession, I was not new to games design- I had been inventing games, both board games, and ball games for years. So there was no random chance about what I put together. When you are a programmer AND a games designer, you are in the best position to tune and design the game for sheer playability. There are no communication issues in the way. But, there is only you. So now, I am completing my new Football Manager type game for the iPhone (name suggestions always welcome!). On the iPhone, once more I am free, just like 30 years ago to program and design the entire game myself. So, if I have my way, it will have my strengths in design- simple to learn, fun, very playable. And of course my weaknesses- not flash on presentation lol! I am close now, I am having fun, creating fun, and that is the way it should be. I will be very happy when the game is (soon) ready for release and I can talk about it and discuss what I have created.